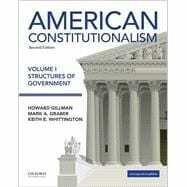 by Gillman, Howard; Graber, Mark A.; Whittington, Keith E.
In American Constitutionalism, Second Edition, renowned authors Howard Gillman, Mark A. Graber, and Keith E. Whittington offer an innovative approach to the two-semester Constitutional Law sequence (Volume 1 covers Institutions and Volume II covers Rights and Liberties) that presents the material in a historical organization within each volume, as opposed to the typical issues-based organization. Looking at Supreme Court decisions historically provides an opportunity for instructors to teach--and students to reflect on--the political factions and climate of the day. The second edition has been streamlined and also features updated cases, analysis, illustrations, and figures. Howard Gillman is Chancellor of the University of and Professor of Law, Political Science, and History at the University of California, Irvine. Mark A. Graber is the Jacob A. France Professor of Constitutionalism at the University of Maryland Francis King Carey School of Law. Keith E. Whittington is William Nelson Cromwell Professor of Politics at Princeton University and Director of Graduate Studies in Politics at Princeton University. I. What Is a Constitution? James Monroe, "Views of the President of the United States on the Subject of Internal Improvements"
John C. Calhoun, "Fort Hill Address"
Henry Winter Davis, "No Peace Before Victory"
Charles Sumner, "State Rebellion, State Suicide"
David J. Brewer, "The Nation's Safeguard"
Woodrow Wilson, "The Meaning of Democracy"
Theodore Roosevelt, "A Charter of Democracy"
George F. Hoar, "Direct Election of Senators"
--Grover Cleveland, "The Independence of the Executive"
Edwin Meese, "The Law of the Constitution"
William H. Rehnquist, "The Notion of a Living Constitution"
William J. Brennan, "The Constitution of the United States: Contemporary Ratification"
Ronald Reagan, "Address to the Nation"
Garcia v. San Antonio Metropolitan Transit Authority et al. Senate Debate on the "Nuclear Option"
Walter Dellinger, "Presidential Authority to Decline to Execute Unconstitutional Statutes"